The Oatman Hotel. Can you spot the burro? Oatman, Arizona is one of those quaint little places you jut have to experience for yourself. More than likely you’ll never pass through Oatman by chance as now the major highways bypass the small town, but a big chunk of the historic Route 66 passes through the center of town. Burros wander the town freely and mock gunfights break out on Main Street during festivals. If you’ve never been to Oatman, now is a great time to take a weekend day trip across the border and see it for yourself. The town of Oatman began as just another mining town in the Mojave Desert in the late 1880s and early 1900s. It grew with a major strike at one of the claims and the population swelled to over 10,000 people. However, the bust came in 1941 when the last remaining mining operations shut down. 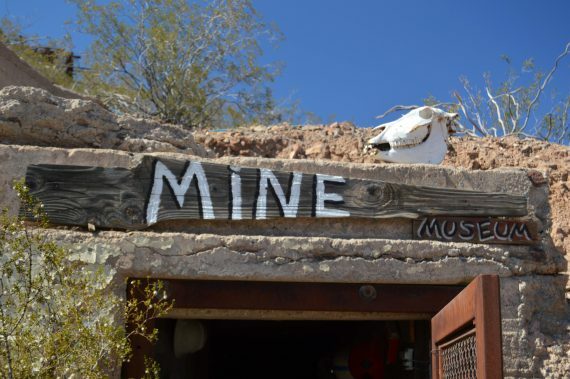 This usually spells doom to old west boomtowns, but not so for Oatman. Route 66 kept motorists passing through Oatman and this allowed businesses to continue in the town. 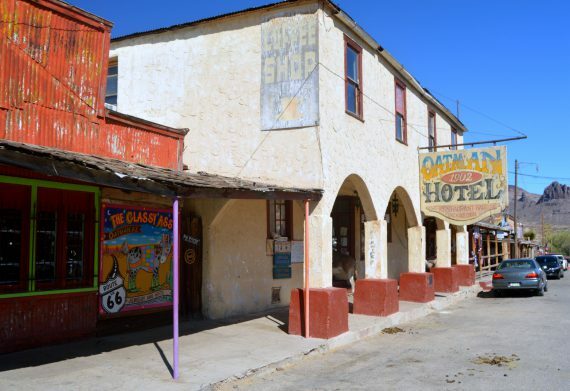 The population drastically shrank but Oatman has never been a ghost town, although it may appear as such in the imaginations of later visitors. 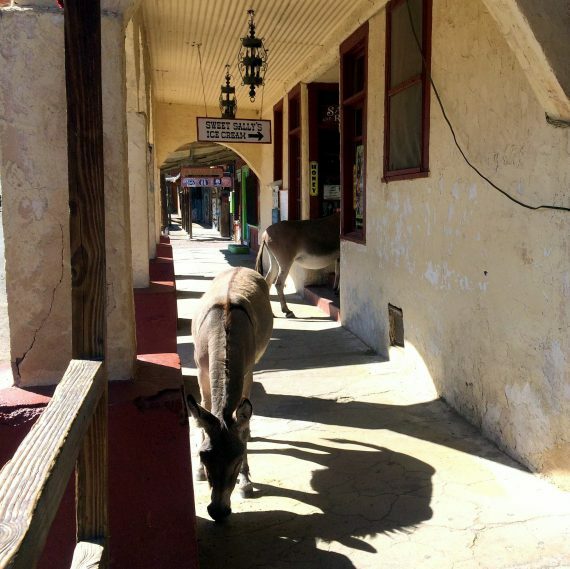 The Oatman Hotel is one of the town’s main attractions, besides the burros of course. As the sign says, the hotel dates to 1902 and was possibly one of the first actual buildings in the town. It was originally named the Durlin Hotel after the hotel’s builder, John Durlin. It suffered some damage during a fire in 1921 that devastated much of the town. The hotel was restored in 1924, renamed to Oatman Hotel in the early 1960s, and has not changed a whole lot since then. Did I mention they have burros? Because they have burros. The Oatman Hotel is said to be quite haunted. The ghost of an Irishman known as “Oatie” has been known to pull sheets off of beds and open the window of his old room, among other things. Oatie was a miner who lived inside the hotel while he worked the local claims; the story goes that he drank far too much one night and collapsed behind the hotel where he was found dead. The ghost of a previous chambermaid is believed to leave behind impressions of a prostrate body in the dust on the floor of a second floor room, and various disturbances have been reported by bartenders over the years as well. Glasses and cash tips have levitated off the bar, lights on and off, disembodied voices are sometimes heard, and the toilets occasionally flush when no one is inside the restrooms. The hotel is home to some famous spirits as well. Clark Gable and his beloved Carole Lombard stayed at the hotel during their honeymoon in 1939, according to the legend anyway, and are believed to haunt their honeymoon suite. The couple has been caught whispering to each other and sometimes laughing inside the suite. Lombard is also said to haunt the Pioneer Saloon in Goodsprings, Nevada where Gable drank himself senseless after the fatal crash that took her life. Who knows, maybe their spirits drift from the site of one of their happier memories to the location of their worst? Unfortunately the Oatman Hotel no longer rents out rooms, but it is still in operation as a restaurant, bar, and ice cream parlor. The Mine Museum is free, but there is not a lot to it. It is still fun to walk through though. The burros that wander the streets of Oatman are often times mistaken for donkeys. The difference between a burro and donkey is simply that burros are wild and donkeys are domesticated; biologically they are the same thing. While they are friendly and comfortable around humans and are even descended from abandoned donkeys left behind by miners decades ago, they are technically wild because they live independently in the mountains. Pretty much any business I town sells burro cubes for visitors to feed to them and the burros will expect you to feed them. Oatman is about a two hour drive from Las Vegas. It is found in the mountains outside of Laughlin, Nevada just southwest of Kingman, Arizona. It is best to plan your trip in the spring or fall as the temperatures climb even higher there during the summer than in Las Vegas. For more information check out roadtripamerica.com.